Hi! 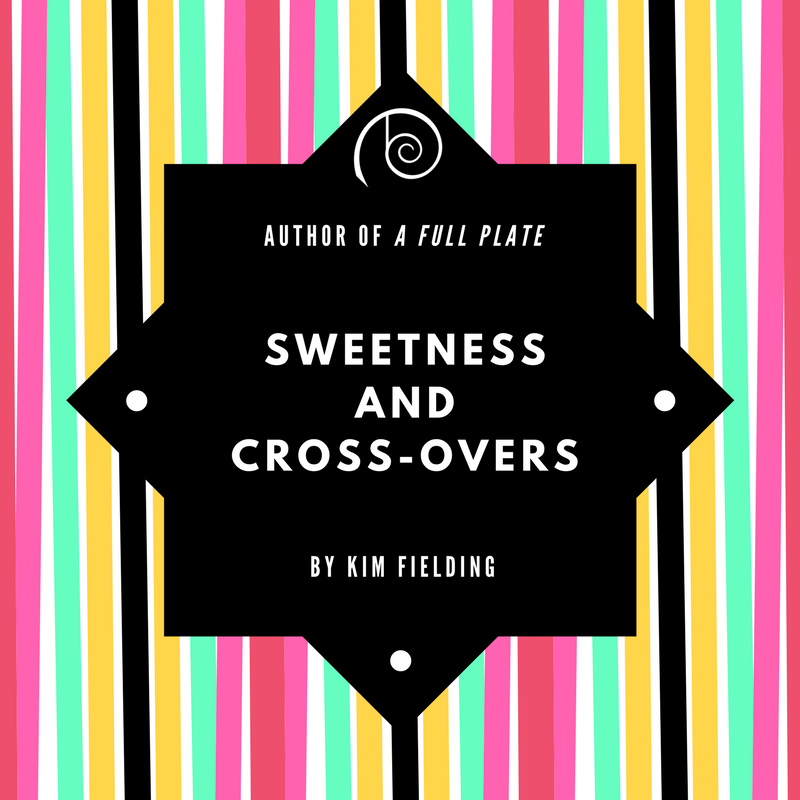 I’m Kim Fielding, and I’m very excited to announce the arrival of my new Dreamspun Desires book, A Full Plate! 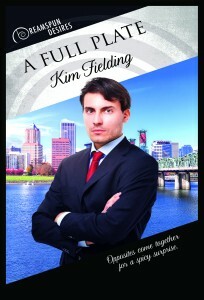 If you’re in the mood for a sweet little opposites-attract romance, this may fit your tastes exactly. How do you feel about crossovers between stories? I’m not talking here about true series, but rather situations in which characters from one book appear—maybe just briefly—in another book. A cameo, perhaps, or a brief intersection of paths. If you’ve read my stories, you may have already guessed that I love these crossovers. For some reason it makes me happy to envision all these imaginary people living in the same imaginary world, going about their individual businesses but sometimes bumping into each other. I think for this to work well, the author has to make sure that the intersections feel natural and that readers who haven’t read all their books won’t be confused. Stephen King does an especially good job of this. I’ve had crossovers to varying extents in some of my stories. For example, the people from the Bones series have interacted with the guys from Speechless a couple of times, most notably in the (free!) short story, “The Gig.” In Ante Up, Ante makes a passing reference to a certain werewolf from Portland. In Astounding!, John and Carter make a quick stop at the little store run by Will and Colby from The Tin Box. 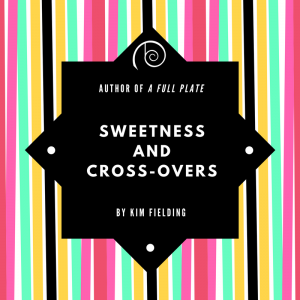 So here’s where I admit—and, I hope, tempt you—that A Full Plate contains a brief intersection with Love Is Heartless. If you haven’t read about Nevin and Colin, don’t worry, you won’t be lost. But if you have, you might enjoy a brief peek back into their world (although they don’t personally appear). Do you like crossovers? What are some of your favorites? Please comment with them. To sweeten the pot, I offer a recipe from my old tin recipe box. A friend gave it to me over 25 years ago; I have no idea where she originally got it. Thaw bread; do not let it rise. Cut one loaf into small cubes and place in 9×13 pan. Melt butter. In medium bowl, mix pudding mix, butter, milk, sugar, and cinnamon. Beat until smooth. Pour over 1st loaf. Cut up second loaf and place pieces on top. Cover and place in fridge overnight or 2 ½ to 3 hours on countertop. Bake at 375F for 30 minutes. Check out A Full Plate today! I’m so glad to know that, Sabine! Crossovers are totally my jam, both as a reader and as a writer–little Easter eggs that let you peek into favorite characters’ lives after the last page of their book. Years ago, I saw a play off-Broadway called “Say Goodnight, Gracie.” It was the first play I’d ever seen (and I was a theater major in my mid-twenties at the time) where I could project the lives of the characters after the final curtain. I love finding evidence of those ongoing lives–even if they’re for fictional people!